In nearly every small town and every large city across the United States, you’re bound to find at least one classic diner in operation. They’re as much part of the fabric of American life as the city hall and local little league baseball field. In all likelihood – even if you’ve lived in the US just a few months – you’ve eaten at a diner. Offering comfort foods and hearty, satisfying meals at usually reasonable prices, diners provide a casual dining experience with serious mass appeal. They have actually been part of the American experience for more than 140 years now, but the definition of what constitutes a ‘diner’ has since evolved somewhat. What is a diner, really? While the word ‘diner’ has come to encompass many different casual dining experiences that share some defining characteristics, the technical definition is a little narrower. The term actually refers to a pre-fabricated food service building that is transported from the factory to a permanent location. Its basic design is based on the traditional railroad dining car: a long, narrow shell equipped with a counter, small kitchen area and row of stools lined up for patrons to sit at the counter. 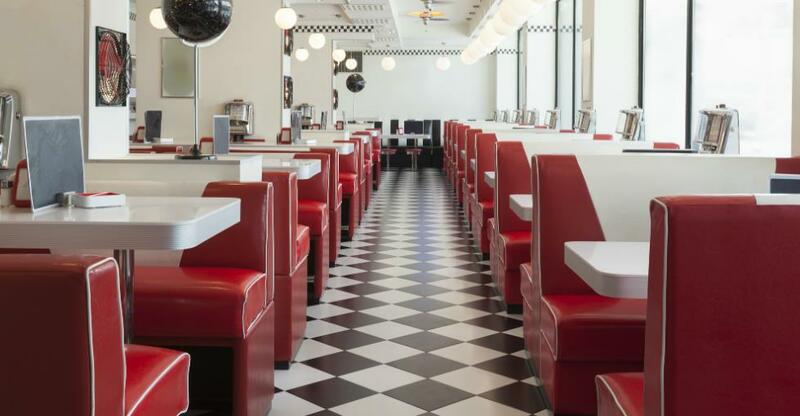 The official diner may or may not include booth-style seating and has changed dozens of times in size, design and building materials as styles, the economy and technology have evolved. Of course, no authority is charged with enforcing this strict definition on all eateries and penalising any coffee shop that presumes to label itself a diner. In fact, this is likely the first time you’ve even heard that such a strict definition exists – and that’s ok: the history of the diner is far broader, and is about enterprising entrepreneurship and community as well as the business model itself. Where was the first diner? The diner’s origins can be traced to a sort of proto-food truck. In 1858, in Providence, Rhode Island a young man named Walter Scott started supplementing his income by selling sandwiches and coffee to shift and overnight workers at the newspaper where he worked as a printer. Eventually, his side business became so popular that he went full-time, buying a horse-drawn, covered express wagon, which he parked outside the Providence Journal offices, serving food not just to newspaper staff but the whole neighborhood. Walter Scott’s idea caught on in a hurry. It wasn’t long before similar ‘lunch wagons’ started showing up all over New England and manufacturers began building wagons specifically for that purpose. Within a few years, the most popular model included a roof and stools inside where patrons could escape the elements. How did the diner get its classic silver design? Those roving restaurants became so numerous that many New England cities and towns passed ordinances requiring that the lunch wagons close up shop at 8pm to reduce congestion and noise in the street. But since the late hours were the most lucrative, many enterprising lunch wagon owners decided to circumvent the ordinances by settling their wagons down permanently on plots throughout each city. Meanwhile, antiquated horse-drawn streetcars were being replaced by electric models, leaving a glut of old streetcars that enterprising businessmen repurposed as stationary, inexpensive premises. The result was a quick transition from wagons to the basic shape and look we still associate with diners today: essentially a railroad dining car without the wheels. From that point forward, the American diner evolved according to trends in décor and culinary tastes, surviving, even thriving, during the Great Depression and WWII, and later capitalizing on the rise of the 1950s suburban family. While the explosion of fast-food restaurants like McDonald’s and White Castle in the mid-20th century certainly eat into the diner’s share of the eating-out market, Americans have never lost their appetite for the neighborhood diner’s homely fare. Indeed, the popularity of many diners has only grown over the decades. Some have opened up with creative takes on the traditional diner menu, often harnessing the latest technology to enhance the customer experience. Thrillist Magazine compiled ‘The 21 Best Diners in America’ nearly two years ago and it still ranks as a best-in-class framework for the greasy spoon connoisseur's next big road trip. Such is their rich history and impact on American culture, a growing number of venerable establishments have even been added to the National Register of Historic Places, with several vintage diners saved from demolition and relocated to new sites, both in the US and Europe. Perhaps the past and future of the American diner is best summed up by The Diner Museum (not a physical location, but an online cultural movement): “In conjunction with saving diner structures it is equally important to help preserve and promote diner culture. Diners evolved into community gathering places where people from all walks of life and origin shared a home-cooked meal in a small and comforting atmosphere. Interested in buying a piece of American history? Explore our American diners for sale or consume our next piece of essential reading how to run a diner.